Japanese Pep Rally? Not so peppy! Tomorrow is the Prefectural Sports Tournament, which means all the various clubs and teams will be battling it out in the fields and courts of our fair Prefecture. It also means that apparently I’ll be on TV, as the local news will be covering the events live. This includes the marching team (not band–they just march, no instruments) with which I will be marching along. If you see a group of fuschia track suits marching like a well-oiled machine with an idiotic white girl that has likely forgotten how to count leading the charge, that’ll be us! I’m slightly concerned that it might look slightly akin to Triumph of the Will, considering the amount of goose-stepping and truly unfortunate gestures will be involved (do we have to raise our arms at precisely that angle? Really?) and I’m kind of hoping that no photographic evidence ends up on the internets (I might like to be able to get a job some day). Anyway, today was the Pep Rally, and it was really, really weird. When I was told we were going to cheer on the students before their big tournament, I expected…cheering. Instead, a representative from each sport stood up on the stage in their uniform and said that they would do their best, and achieve their goals, and thanks for cheering for us blabla yoroshiku. It was so solemn and weird. I know solemn ceremonies shouldn’t surprise me in the least in Japan, but I couldn’t help it! The cheerleaders did get slightly involved, when they stood up and made elaborate arm motions while the Baseball boys sang a solemn song as they stood with their pelvises thrust in the air. I wish I could have gotten a picture of their hilarious stance, but I don’t think it would have done them justice. So one single solemn song, a bunch of serious speeches, and some clapping. Weirdest pep rally I’ve ever seen. Also, I haven’t even written up the story of my insane day on Wednesday, which included a surprise visit to my school from the Ambassador of Ireland (I swear, that’s how he was introduced to me.) It was such a crazy day I felt like I had accidentally wandered onto the set of a Mockumentary, and a film crew would pop out at any moment. AND NOW THEY ARE. Be sure to watch Gunma テレビ tomorrow morning to catch the fun! This entry was posted in School Life and tagged japanese school, school, school days, school life, sports, Television, terebi. Bookmark the permalink. 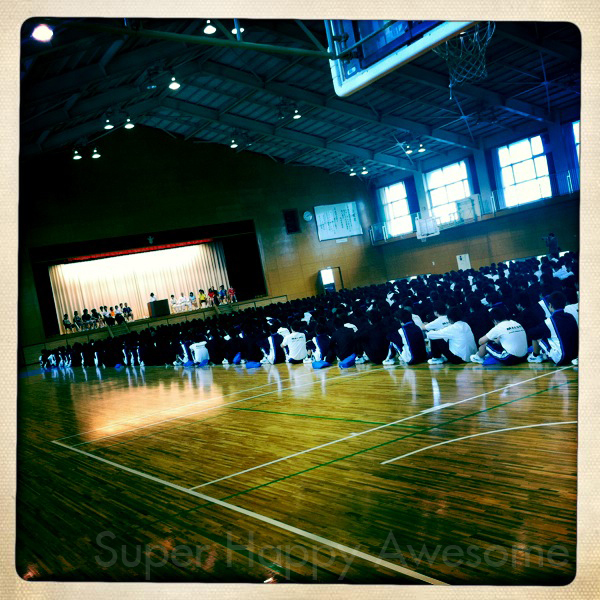 1 Response to Japanese Pep Rally? Not so peppy! So, all in all .. having an ‘interesting’ time….